I'm doing another one of these, so I'm reviving this thread. Go here for Part 2, otherwise look at this page to see what was already suggested. Do some NES games remind you of classic rock songs? I realized I screwed up at the Rush - Freewill entry. I'm going to be making an update to this video, so any suggestions to add are highly welcomed! And I used couple from here, thanks guys! Thanks again, guys! This has been the most helpful place I've posted this. Last edited by Jedi QuestMaster on Wed Dec 13, 2017 1:20 am, edited 9 times in total. Indeed, Classic rock inspired many game soundtracks, especially for Japanese musicians. The Zelda title and underworld music were inspired by Deep Purple's "April." 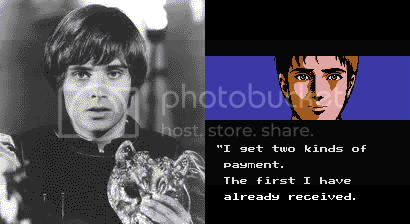 Ninja Gaiden's ending was also a copy of "What is a Youth" on the 1969 Romeo & Juliet soundtrack. "Fever" from Dr. Mario is "Lady Madonna" by the Beatles. Not only was the love theme music used from Romeo & Juliet, but Ryu Hayabusa is modeled after Leonard Whiting. With Japanese character names like "Rock" and "Roll", it doesn't seem to be a secret that music from the NES period was heavily influenced by the music of that time. Even most of the upbeat music from the NES action games were conducted in the same meter as rock. Here's another one from the Dr. Mario Chills theme. "Chill"? Don't get me started about similarities between this part and the theme from 3-2-1 Contact and "Pray" by MC Hammer. Oh, and "Lady Madonna" isn't the only song that Hip Tanaka nicked for "Fever". Compare the end of "Fever" to the beginning of "Bad" by Michael Jackson (find it yourself because Sony Music Entertainment and VEVO like to region-code their videos). And guess who owns the rights to both the Lennon/McCartney and Mijac repertories. Speaking of "don't get me started", here's the previous topic on recycled music. Yeah, Dr. Mario always reminded me of St. Thomas as well. I always thought Dwelling of Doom from Simon's Quest and Yngwie Malmsteen's Far Beyond The Sun sounded kinda similar. Dunno which was released first though. I always thought Dwelling of Doom from Simon's Quest and Yngwie Malmsteen's Far Beyond The Sun sounded kinda similar. Hey, thanks! I'll definitely use that one. But I haven't had anymore NES -> Rock comparisons. Does anyone know of any?